West Ham produced a superb performance teeming with passion, flair and desire as they sealed victory in a massive relegation six-pointer against Southampton on Saturday. The Hammers are now heavy favourites to beat the drop, while the odds plummeted on the vanquished Saints going down. 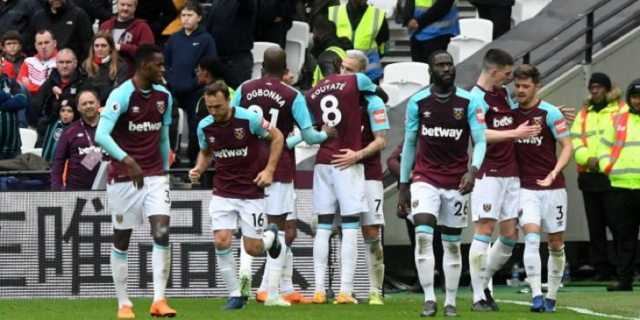 The win propelled West Ham all the way up to the giddy heights of 14th in the table, and they could even secure a top half finish if they maintain such a high level of performance. But their lead over Southampton is still only five points and, with seven games to go, there is no room for complacency as they could still get sucked back into the relegation scrap. The fans will have a massive role to play between now and the end of the season, as they can either inspire the team or cause their heads to drop. The mood in the ground on Saturday stood in stark contrast to the toxic atmosphere that accompanied the 3-0 defeat at the hands of Burnley last time out. Before the pitch invasions, West Ham were still in that game, but the protests clearly affected the players, their confidence suffered and Sean Dyche's men capitalised to devastating effect. But this weekend the protests were mainly confined to the pre-game marches, while a semblance of optimism prevailed inside the stadium. Joao Mario urged fans to continue to "make the difference" heading into the business end of the season. "It was impressive from our supporters today," said the Portuguese midfielder. "I just want to say thank you to them, and let's continue like that for the next home game against Stoke City. I just want them to make the difference in that game, as they did today. All the team wanted to change the situation from the last match here, which we lost, and it was an important phase of the week so we're just happy to get three points today and come up the table." The fixture list is pretty daunting going forwards - the Hammers still have to contend with away trips to Chelsea, Arsenal, and Leicester, while they host Man City and Everton - so the game at home to Stoke on April 16 is huge. It will be their best chance to get three points between now and the end of the campaign, and it will also be a great opportunity to stick the knife into a relegation rival. Check a review of the different betting sites and you will see that West Brom are all but down and have no hope of survival, while the clubs most likely to join them are Stoke and Huddersfield. Then Southampton are 5/4, Swansea are 6/1, Crystal Palace are 7/1 and the Hammers are all the way out at 11/1. yes its a big well done all round but why can't they play at this level more consistently? agree on consistency but really enjoying the winning feeling. The LS atmosphere on Saturday was brilliant. No surprise, 50 odd thousand people who, contrary to some beliefs, come week in week out to see that sort of performance and get behind their club! COYI's!!!!!! Deano's bicycle kick goal against Manure was every bit as good as Ronaldo's recent wonder-goal. Yes, Arnie reminds me a little of Deano when he was healthy that first season and a bit. He has fight. Really like that about him. Keep feeding him the ball!!!! change of position and confidence boost? Bilic didnt know where to play him. he stuck him out wide left which may have been where he was at stoke but over there i don't recall him pulling up any trees in that position. Moyes to his credit recognised his ability, and moved him central. first floating behind the striker, now up front. He sees more of the ball, has gained confidence from scoring more goals and must be relieved that the man in charge knows how to get the best out of him. Probably got stale at stoke (no surprise there) & when he first came to us it looked like he couldnt be arsed! !Now hes as important to us as payet was,just hope one of the "big" boys doesnt come sniffing in the summer. Sullys having a rest this week so she takes over the circus...apparently the L.S will cost westham 1 billion pounds over the course of our tenancy,thats the tenancy that lasts 99 years! !3 million annual rent + 6 million raised on match days goes to the stadium operators per season...but she fails to mention the rest of the money this board make from T.V revenue,corporate packages,season tickets,membership,match day tickets,catering & drinks on match days,merchandise,etc....the only people she is kidding is herself!! huh? so the reason we moved was……? So what is she trying to point out with all that crap about 99 year expense,im going to give british gas a good few thousand in the next few years on heating bills,everone has expenses to pay,so big deal,whats her point,are we supposed to be impressed. I never liked being other fans favourites as they were the ones who normally beat us!